Inspired by the self-healing process of trees Manufract has created a new and unique furniture line. If a tree gets injured, it will naturally release resin to close the wound. The natural concept of wound healing is used for the manufacturing process of these products. Broken pieces of wood are form filled with an eco-resin to get the full, final shape. Each piece is carefully selected from broken hardwood stock. It is then manually crafted and hand polished. 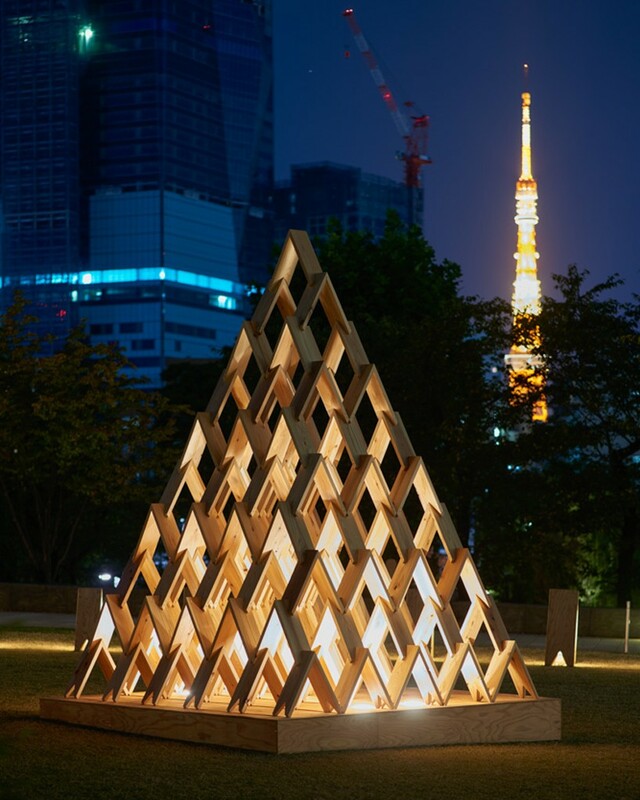 In collaboration with Ryuichi Sakamoto’s forest conservation organization More Trees, architect Kengo Kuma has designed a set of triangular-shaped modular pieces. Called Tsumiki, a name that means ‘wooden blocks’ in Japanese, the individual components can be stacked and assembled in a variety of ways, allowing the user to create original sculptures. Tsumiki will soon be available to buy in Japan. Cardboard Chaos is at it again! This episode they are working with the Fender Custom Shop to see if paper has the ability to handle the look, feel and sound of one of the world’s most recognizable guitars, the Fender Stratocaster. Anything in cardboard can look good, but will it sound good? It’s a tall order and with roughly 250 lbs of torque put on the neck of a guitar from the strings there are some obvious challenges at hand. Within the Malaysian town of Butterworth, Kuala Lumpur-based architect and artist Jun Ong has embedded a five-story lighting installation within the core of an unfinished concrete building. Spanning the full height of the architectural skeleton, ‘star’ pierces through several floors of the disused structure to form a 12-sided, three-dimensional object. During the inaugural Dubai Design week, a series of installations placed in strategic locations around the city highlight renowned international and local design talent. As an exploration of tradition coupled with contemporary aesthetic techniques, Dubai-based designer Aljoud Lootah presents a sculptural project for both the creative community and passersby on the city’s beach by Meraas. Drawing insight from the local heritage, craftspeople and everyday practices, Lootah has based the installation ‘Yaroof’ off of a type of traditional fishing from the region. Steve Wintercroft and his wife, Marianne have been designing and supplying unique masks to creative people and festival goers around the globe since 2013. The paper masks idea comes from Steve’s own need for a Halloween costume one year. Eventually the goal became to create a set of masks that could be built by anyone, using local materials, removing the need for mass manufacturing or shipping and with a minimal environmental impact. This beautiful advertisement was created by Japanese Agency Drill Inc. who built a giant wooden xylophone (reportedly over 1 mile long) in the middle of a forest in Hokkaido, Japan. The notes were made up of Bach's Cantata 147. Cassava is one of the crops that is being cultivated the most in Thailand and during certain times of the year, farmers face an excessive supply of it, causing a huge amount of waste and pollution. Wanting to find a solution to this problem and a use for all the waste material, designer Anon Pairot created ‘Penta’, a pendant lamp that carries an aesthetic value and is environmentally friendly. The modular components create no waste and optimize the form which references the cassava leafs themselves. Further, any defective or damaged part can be reprocessed and blended into a new lamp.